One of the Restios, Baloskion tetraphyllum is a rush or reed like plant commonly called the Tassel Cord Rush. It is an excellent ornamental plant for shaded moist positions. 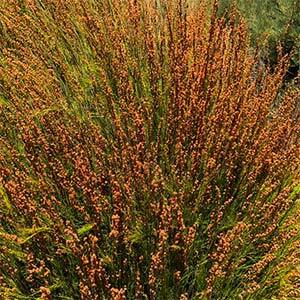 An evergreen perennial it is suited to growing in containers and near the margins of ponds. 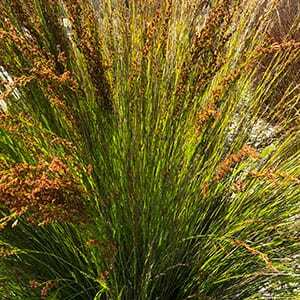 A more compact lower growing form ‘Feather Top’ is also available that will not set seed. The foliage of both forms is an attractive green, when in flower the seed heads dominate the plant and are a rusty red, a real feature in summer. The seed heads will attract birds into the garden in summer to autumn. This is a plant that works well in damp to wet areas of the garden. It will cope with temporary inundation, however not with permanently boggy wet soils. Pruning should be carried out every 3 – 4 years as the plant becomes a little untidy. Simply cut the whole plant back by 1/2 to 2/3rds. Propagation is easy, usually from seed or division of clumps. Common Name – Tassel Cord Rush. Feather Rush. Soil – Moist soil, it will survive in wet soils. Foliage – Green with a with red to brown colouring in spring. Flowers – Red to brown. Pruning – Cut back to tidy up every few years.